Once the decision has been made to use a liability-limiting entity, it is well worth thinking through whether the new business is best served by forming an LLC, an S corporation, or a C corporation. Each brings different benefits and consequences. The plusses of LLCs include flexibility (an LLC is a creature of contract, and the specific agreements in that contract govern the rights of the parties), ease of formation, simple basic structure, ease of management, and apparent simplicity of tax issues since they would typically (unless selecting other tax treatment) be either disregarded entities for tax purposes (single-member LLCs) or taxed as partnerships (multiple-member LLCs) with pass-through treatment of profits and losses. However, there, simplicity can end. For this and many other reasons, it is essential to consult quality corporate-securities-tax counsel and your CPA for an assessment of and advice on the issues arising from your LLC and your operating agreement. The operating agreement is the controlling organizational agreement among the members. 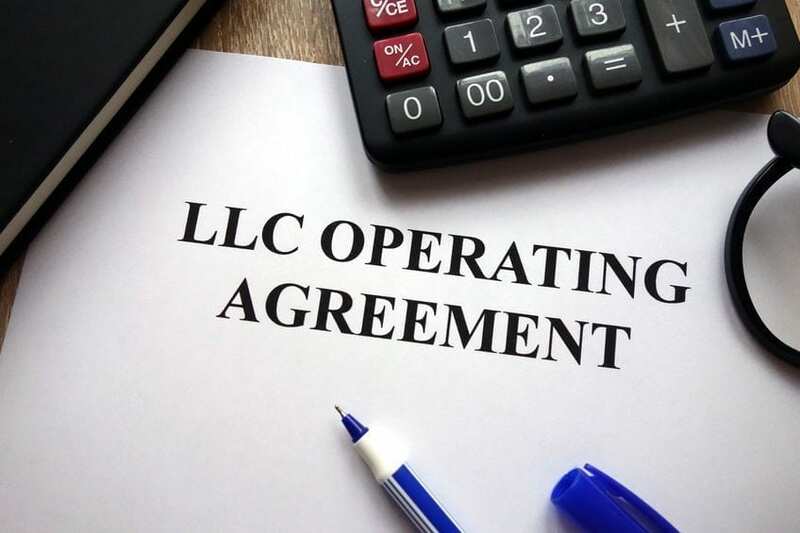 The operating agreement, generally, and generally in concert with the LLC Act in the local jurisdiction, is the ultimate arbiter of all issues affecting the LLC, its members, the company’s business, and taxation. It is possible to form an LLC without having an operating agreement, but that could prove rash. It is often prudent to hash out all the issues in the operating agreement before forming the LLC. One could also consider providing a window in the operating agreement that, for a selected period of time after formation, the manager has the right to consult tax attorneys or CPAs and amend the operating agreement based on any advice the manager receives. Length: Operating agreements are enormously variable and the ones I’ve seen range from very simplistic to truly excellent. They range from 10 pages to 60 pages, as a norm. While length does not necessarily equal quality, as a rule of thumb, if your Operating Agreement is 10 pages, it probably lacks whole bunches of things an entrepreneur may come to wish were in it. Domicile: While you can form an LLC in virtually any state, plus D.C. (and even in Native American tribal nations), and although many states adhere to an extent to the Revised Uniform LLC Act (and around 20 have adopted it), each state’s courts may have different ways of interpreting the local Act and issues affecting LLCs, managers, and members. Taxation and annual reporting requirements also differ from state to state. Membership: What type? Will all members hold “common interests” or will there be “special rights members?” If not, all members will be created and treated equally, so careful consideration of the resulting issues will be needed and then included in the operating agreement. Options: One thing many startups want to do–and think about creating–is an employee stock option pool. To oversimplify, you can’t readily do this in an LLC: ISOs (incentive stock options) can’t be granted, and there still is no final guidance from the IRS on NQSOs (non-qualified stock options). However, there are LLC workarounds that can provide similar results, and rewards, to valued employees, contractors, advisors, and other stakeholders, but these too require careful evaluation and drafting of specific terms in the operating agreement. Control: One thing to think carefully about in an operating agreement is how control, management, and voting rights are described. As a rule of thumb, many (if not most) operating agreements refer to “membership interests,” or “company percentage interests,” but those percentages do not always, or necessarily, translate directly into control, management, or voting rights. As a matter of fact, the Delaware Act doesn’t even refer to membership interests; it refers to limited liability company interests and defines that phrase in a way that does not necessarily mean membership interests in the way hoped for by some members. Management: The executive of an LLC is the manager. As such, another threshold issue is to decide if the LLC is “member-managed” or “manager-managed.” The general difference is whether all the members make decisions based on some factors such as their percentage ownership(s), or whether management rights, controls, and duties have been assigned to a manager. The manager can be a person, several persons, or even another LLC, for example. One area of often-overlooked risk is that LLC managers and members frequently adopt corporate titles like CEO, COO, President, or Chief Marketing Officer. If this is done, it is important that the operating agreement defines the rights, duties, and obligations of the persons holding these titles. Also of concern are the unintended consequences of using these titles without adequate definition. For example, unless expressly disclaimed in the operating agreement, an LLC manager calling himself or herself CEO may find, in the event of a dispute, that the use of that title created added fiduciary duties normally attendant to that role in a corporation. Once again, this is a subject for careful drafting of an operating agreement. Investment: Entrepreneurs seeking investment commonly use LLCs, but LLCs are often not ideal vehicles for the startup’s investment plan. One reason for this may be that significant investors often want preferred status and treatment for issues of liquidity, dissolution, control event, and allocation of losses. Handling such matters may be more easily accomplished with a C corporation’s preferred stock and can be a lot “messier” in an LLC since it often will require careful redrafting of the operating agreement to encompass items such as special rights memberships, special income and tax allocations, voting rights or lack thereof, and “conversion to common” provisions. Contributions: If the members are making contributions of different types to the LLC, the type, nature, and value of the contributions all need to be carefully considered, and mechanisms for appraising/approving claims of value should be considered. In such a case, the operating agreement might do well to contain special contribution terms with statements of valuation that will then impact the members’ respective capital accounts. Nature of Interests: In general, all “normal” LLC members will have capital accounts, but will, in each case, be subject to basis limitations affecting their tax treatment. Moreover, if there are (as often occurs) LLC members whose contribution was sweat equity, or intangible property not readily capable of valuation, these members may hold “profits interests.” What the specific rights of these profits interests holders are with respect to management, control, voting, allocations, and distributions are issues that need to be carefully considered in the operating agreement. Obligations: Another issue that is critical to address in an operating agreement (and rarely is to the extent it should be) is what are the specific obligations of management. For example, in Delaware, the manager of an LLC is generally subject to 3 fiduciary duties: loyalty, due care, and the subsidiary fiduciary duty of good faith. In the event of prickly times, woe betides the manager who isn’t aware of how the Delaware courts (Chancery Court and Delaware Supreme Court) have defined these fiduciary duties. It could be vitally important to managers and members to define these in the operating agreement or, better yet, consider waiving the fiduciary duties of loyalty and due care, leaving only good faith (which can’t be waived). Moreover, in Delaware (for example), majority and controlling members are subject to the same fiduciary duties vis-a-vis minority members unless these fiduciary duties are expressly waived in the operating agreement. Indemnification and Advancement: Most operating agreements generally provide for indemnification of manager and members other than for acts that are intentional, negligent, or taken in bad faith. Unfortunately, these common terms can be a death trap for the unwary. Firstly, any act taken by a manager arguably is, by definition, intentional in that he or she intended to take the act. Second, negligence is hugely broad, as is bad faith, unless these terms are carefully defined, waived, or limited. Of greater concern is the fact that many operating agreements provide for indemnification, but fail to provide for the advancement of legal costs and fees to the indemnified party in the event of a claim. This should be carefully spelled out in the operating agreement. In conclusion, one of the most important things a startup management team can embark on in forming an LLC is to engage in a careful, in-depth, and well-informed assessment of what the company’s operating agreement really needs to contain. Disclaimer: Cayenne Consulting is not a law firm and does not offer legal advice. This article is for informational purposes only. Entrepreneurs should seek qualified counsel when selecting and forming a legal entity.